So I started playing early this year, but i have played runescape back in 2006-2008 ish. I have been playing alot and like making goals like Barrows gloves (Completed) Quest cape (in progress). 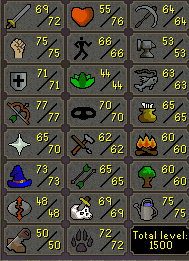 I love PKing although i know that my stats are not really up for it yet, im also grinding for raids in the future. Dont have any history with clans in RS, did play in pretty high ranked teams in League of legends. My name is Rick, im an 18 years old male and I study psychology. Im passionate about games not just video but also Boardgames, cardgames and sportgames etc. How did you hear about us? Asked a friend about sweet clans. Welcome to the forums. Who was your friend that told you about WG?